America’s Gulf Coast states attract people from all over the world to their beautiful beaches. And right alongside a flourishing tourism industry exists a robust oil and natural gas industry, as EID’s latest infographic shows. EID recently took a deeper look at the tourism industries of Florida and Texas, and in this report dives into the Gulf Coast region as a whole, including Louisiana, Mississippi and Alabama. It’s no secret the coastal region of the Gulf of Mexico holds many popular tourist destinations, and each year the region sees more visitors. 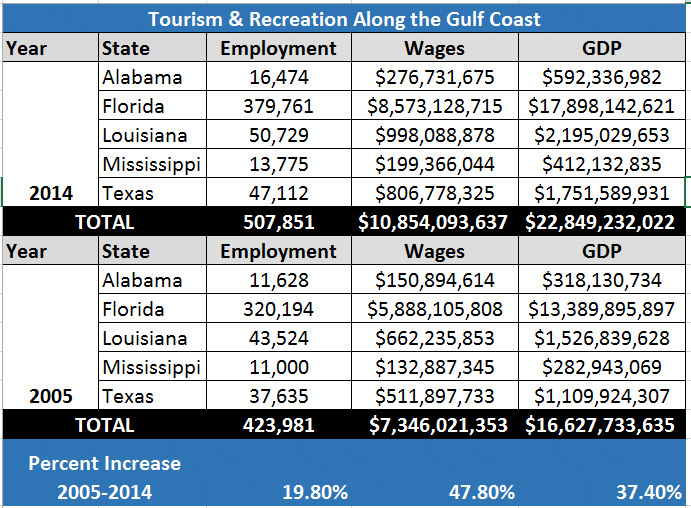 Data available on OceanEconomics.org show that the Gulf Coast’s tourism and recreation industries saw growth in employment by 19.8 percent, wages by 47.8 percent and GPD by 37.4 percent from 2005 to 2014. And thanks to near record oil production made possible by fracking, Americans are saving money at the pump — especially in the south — freeing up funds for even more travel in 2017 to places like the Gulf of Mexico. 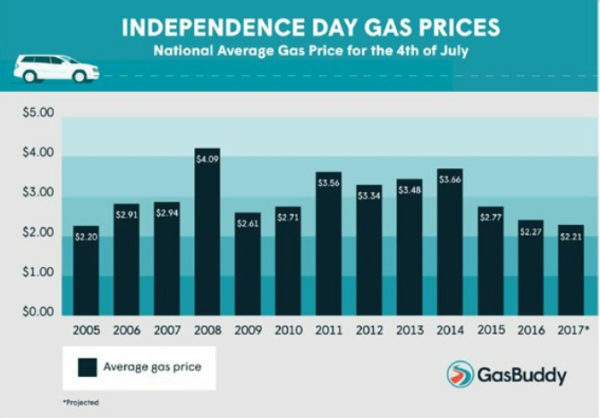 Gasbuddy.com even reported that over the recent Fourth of July holiday, gas prices were at their lowest levels since 2005! 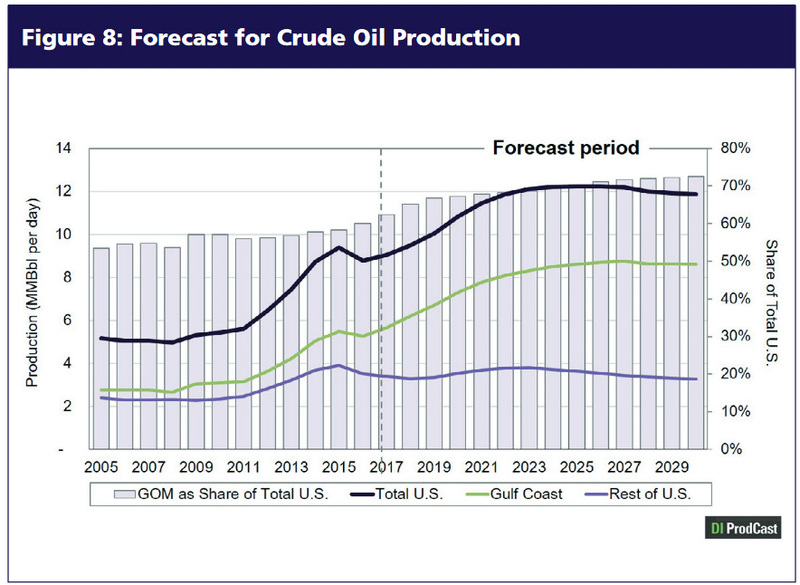 LSU’s outlook also shows how the Gulf Coast will continue to be a major player in U.S. oil and natural gas production throughout the next decade. Just how many are we talking about? 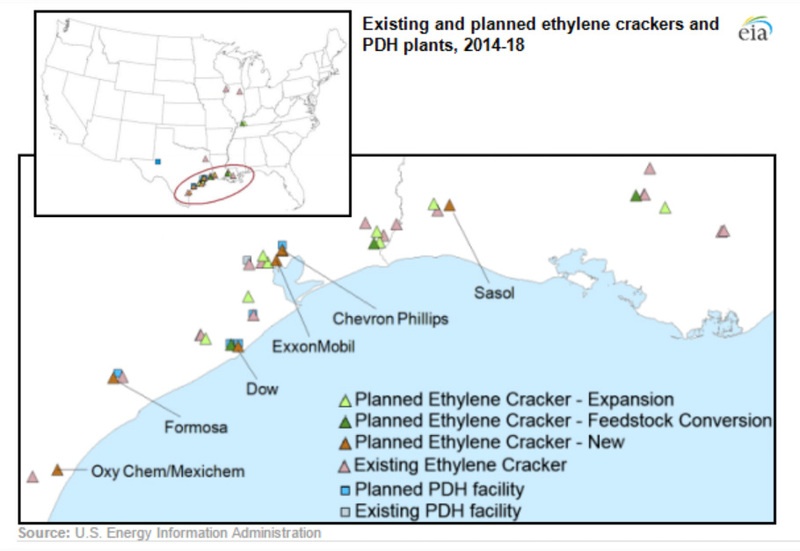 Out of nine new cracker plants slated for the United States, eight will find their home in the Gulf Coast. In addition to this there are five facilities getting expansions or restarting and four of those are located in the Gulf Coast. Clearly, the Gulf Coast region relies on both its tourism and oil and gas industries — both of which are primed for further growth. Let’s take a closer look at a few of the individual states that make up this thriving region. 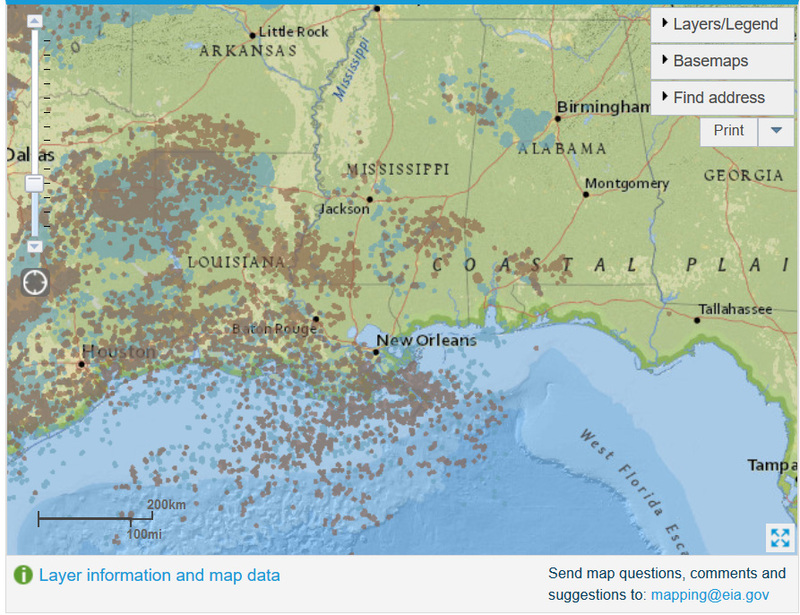 Louisiana is second only to Texas when it comes to Gulf Coast oil and gas production, so it should be no surprise that Louisiana has played a major role in supplying the United States with energy for more than a century. In fact, according to a 2014 study by economist Dr. Loren Scott, the oil and gas industry had a combined direct and indirect impact of $73.8 billion in 2014, with each oil and gas job – which can be found in every parish in the state – supporting four additional jobs . In 2013, the industry paid $1.5 billion in state taxes plus another $1.4 billion for household earnings and $410 million in ad valorem taxes. The state is also home to 18 operational petroleum refineries, and according to EIA is “second only to Texas in both total and operating refinery capacity.” These 18 facilities refine 3.2 million barrels of crude every day, according to the Louisiana Mid-Continent Oil and Gas Association, and employ over 6,000 workers. While those figures are a few years old, the petroleum industry in Louisiana is contributing greatly in 2017 as well. 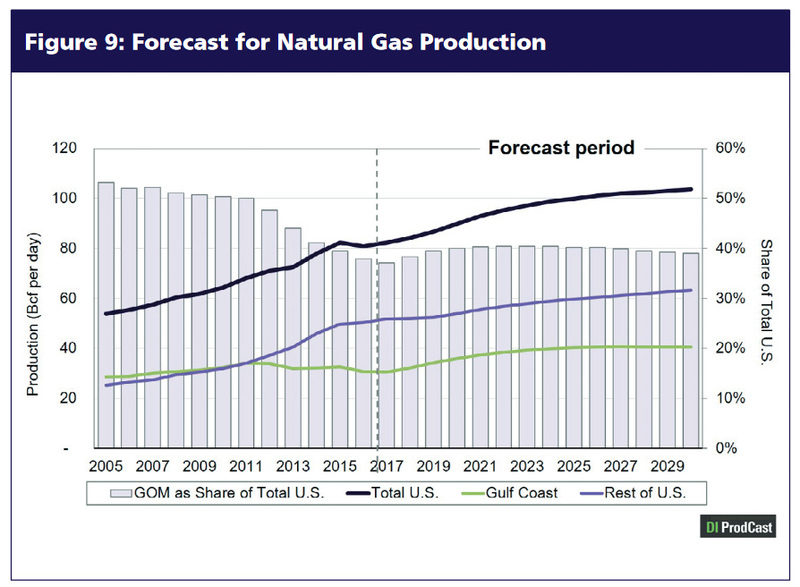 In fact, with the rejuvenation of the Haynesville Shale play and its proximity to existing pipeline infrastructure and coastal ports, Louisiana is primed to become an even bigger player in the growing U.S. LNG market. There are currently four approved LNG export facilities in operation or in various phases of development in the state. 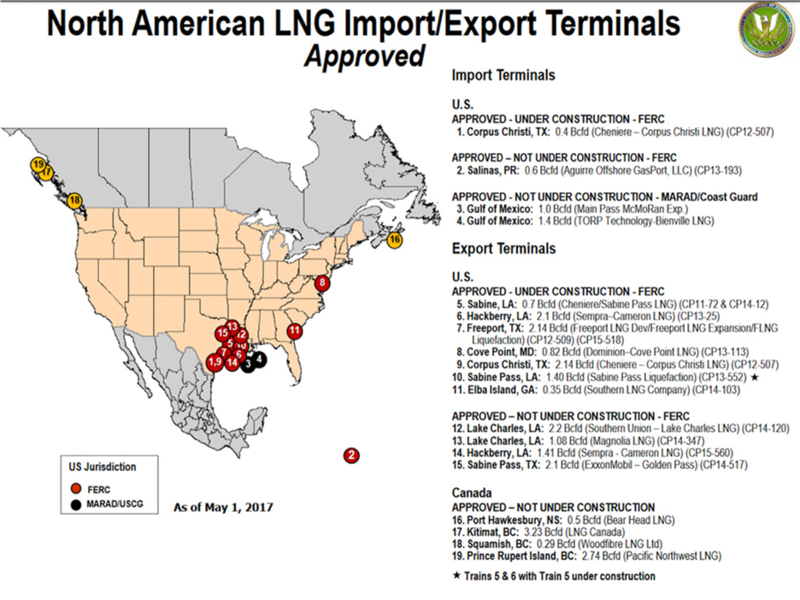 Cheniere’s Sabine Pass facility shipped the first cargo of U.S. LNG to Brazil in February 2016 and hasn’t slowed down since. It hit a milestone 100th shipment in April 2017 and has thus far delivered to 24 countries on five continents. And that’s with only three of the six proposed trains for the facility operational! 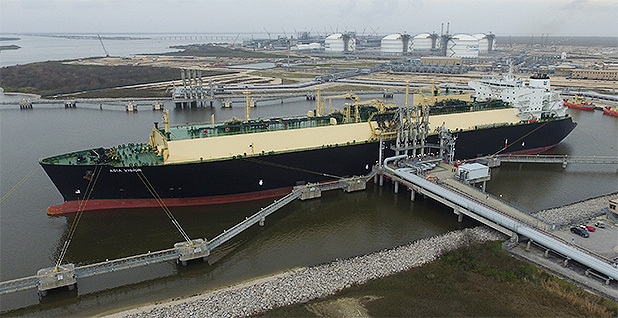 Cheniere’s Sabine Pass LNG export facility. 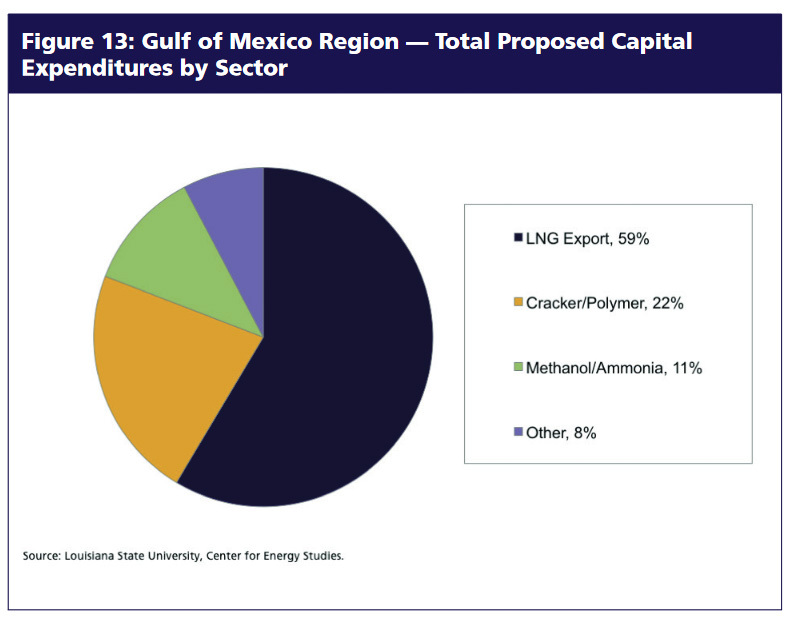 But LNG export facilities aren’t the only examples of major new investments in the state attributable to an ample supply of natural gas. Sasol is building an ethane cracker facility at Westlake in Calcasieu Parish – one of three slated for the state which also houses America’s only facility to be restarted – that will generate billions of dollars and employ 5,000 people according to Dr. Jim Richardson, author of a 2016 economic impact study on the facility. 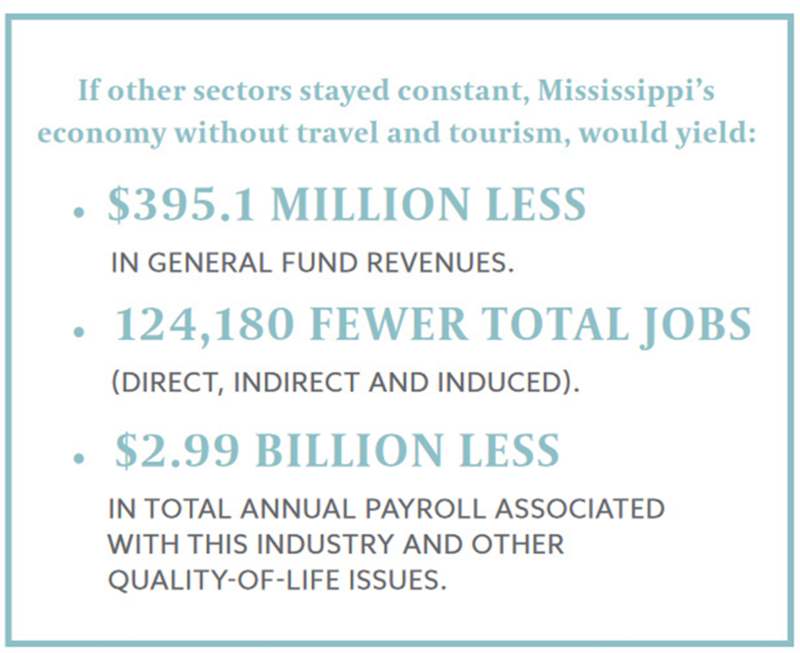 As is the case in America’s top oil and gas producing states, this increased shale-driven development and investment hasn’t put a damper on Louisiana’s tourism industry. In 2016, travel and tourism was the fourth largest employer in the state, accommodating more than 46 million visitors. Louisiana received 68 percent more in visitor spending, 32.1 percent more in taxes and had 57.5 percent more tourism-related jobs in 2016 than in 2011. Considering there are oil and gas wells and other related infrastructure located in every parish in the state, it is clear that Louisiana’s oil and gas and tourism industries are not merely co-existing — they are both thriving. 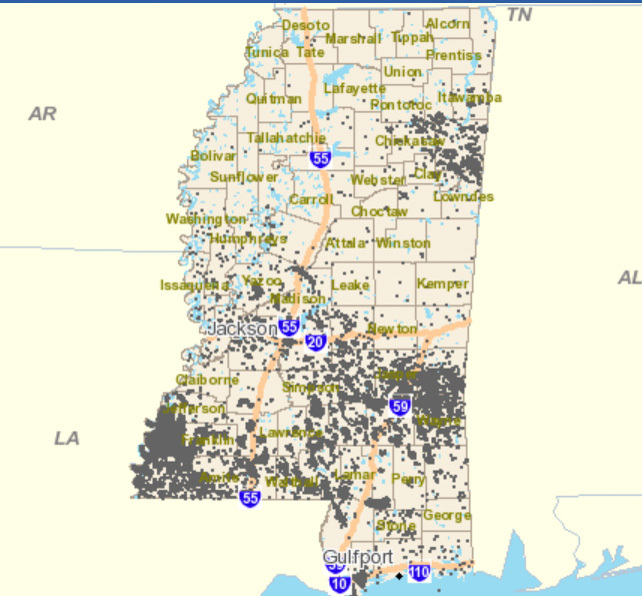 Although Mississippi – where oil and gas was first discovered in 1903 – does not boast the reserves of neighboring Texas and Louisiana, oil and gas has had a significant role in Mississippi’s economy for more than a century. The Magnolia State is also home to one of the nation’s largest petroleum refineries, and according to the Energy Information Administration (EIA), one of its two smaller refineries is the “world’s largest manufacturer of naphthenic process oils, which are used worldwide in many industrial applications.” Further, Mississippi has the largest natural gas processing plant on the Gulf Coast, and an LNG terminal that will be converted from an import to export facility due to the abundance of U.S. natural gas. “In 2015, the energy sector accounted for $6.7 billion of the state’s $105.8 billion gross domestic product, according to a study by the National Strategic Planning and Analysis Research Center, a research unit of Mississippi State University. Out of Mississippi’s 82 counties, Adams County which has the most oil and gas wells with over 5,000, ranked 13th in visitor spending in 2016. This once again shows that oil and gas is not impeding tourism by any stretch, including in high producing counties like Adams County, Mississippi. 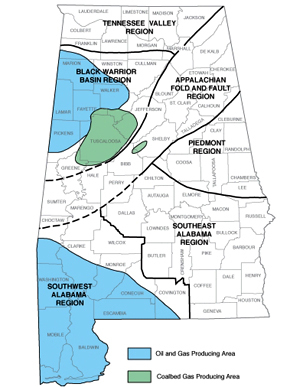 In addition to a thriving century-old oil and gas industry, Alabama also has a robust tourism industry where two of the state’s most visited counties – Mobile and Baldwin – are also home to hundreds of producing oil and gas wells. 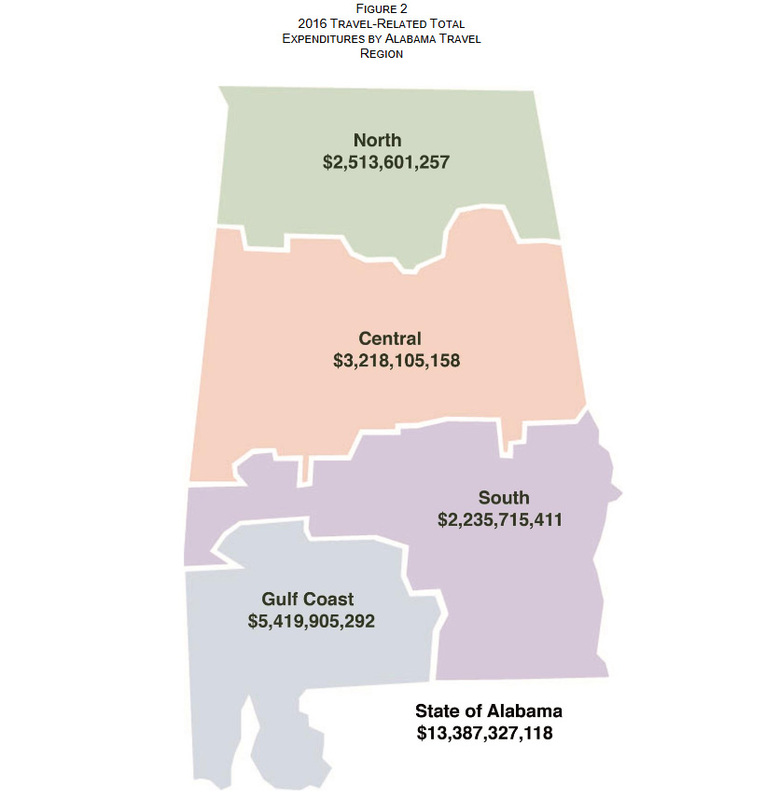 In 2016, tourist expenditures in Alabama were $13.4 billion, a growth of 96 percent since 2003 according to the state’s 2016 Travel Economic Impact report. That same year, the state saw 25.8 million visitors with the most people – 6.3 million – venturing to Baldwin County and another 3.2 million visiting Mobile County. “Baldwin County, home to Alabama’s sugar-white sand beaches, leads in the way — by far — in tourism activity. The 6.3 million visitors to Baldwin County represented a 3.3 percent bounce from 2015, and is nearly one-fourth of all the tourists who visit Alabama each year. In other words, Alabama is yet another state that shows it is possible to produce American energy and grow the tourism industry – all in the same counties. 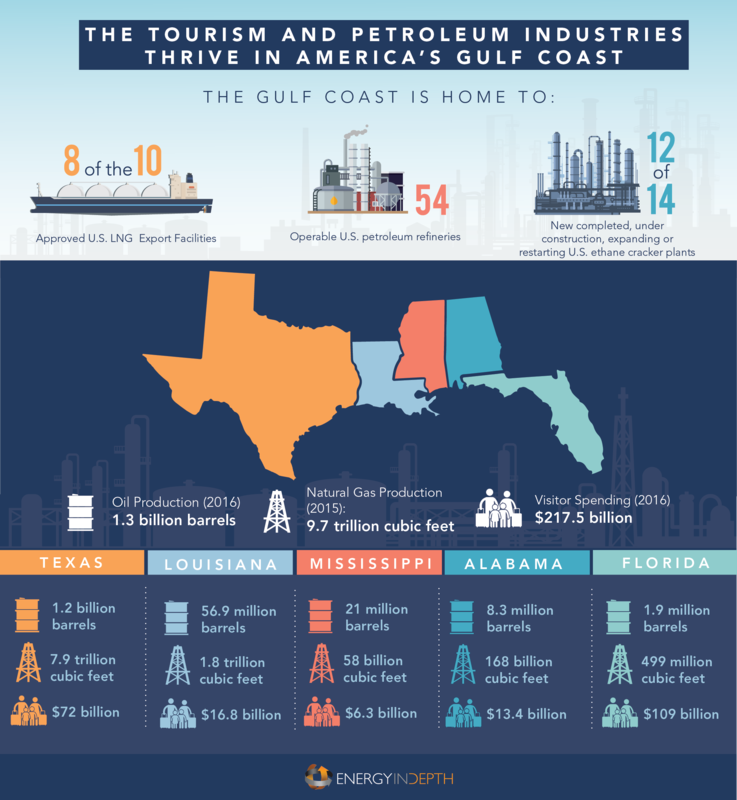 Thanks to robust tourism and oil and gas industries, America’s Gulf Coast is both an amazing place to visit and an important player in fueling the nation and world’s energy needs.